Fallbrook Equipment Rental has been serving the San Diego / Riverside area since 1966 with construction, Industrial, and homeowners equipment. Our original location was located on Fallbrook street with just a ¼ acre parcel. Rick Windbigler purchased the corporation in 1994 and had a goal to serve our customer base with late model, well maintained rental equipment. 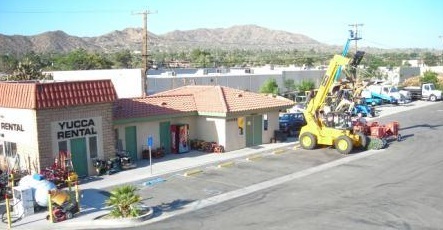 In 1997 we acquired Yucca Rental located in Yucca Valley, moving it to the current location in 2002, which serves the entire Imperial county including 29 Palms Marine Base. In 1999 Fallbrook moved to its current location on a 2 acre parcel with over 8000 sq. feet of storage and shop buildings. We also added over 6 million dollars worth of equipment for both locations so we can properly provide the equipment to our customers when they need it, on time, and ready for work. Our staff is the most experienced, qualified, service minded rental agents that you will deal with. We are here to make your job run smoother. We do that by taking the hassle out of your day by paying attention to detail with every rental. Your one call to our facilities is all you will need to make you feel confident your equipment will be delivered as requested every time. We are a dealer for many manufactures and can quote you great pricing and availability on most contractor and homeowner equipment. We also sell propane at both locations. In our retail department we carry everything you need when renting our equipment to get the job done. At the Fallbrook location we carry Cart-A-Way cement mixing trailers so you can haul your own concrete, ready mixed, to your location, up to a yard at a time. We also carry bagged concrete, mortar, lime, ready crete, and sell loose material out of our 25 yard bins such as sand, rock, c-mix, and Masonry sand. We appreciate our loyal customers and look forward to serving both our new and old customers now and in the future.